I write this as much of the country is enduring a heat wave with record high temperatures in many places (including here in the Northeast) where every day has been in the mid- to upper-90s and Central Hudson Gas & Electric is cleaning up financially from all the air conditioning. One common misconception many people have is that it's hotter in the summer because the Earth is closer to the Sun during this time. As a matter of fact, the exact opposite is true - we're actually near our furthest point from the Sun right now. Polish mathematician and astronomer Nicolaus Copernicus (1473-1543) is crediting with publishing the first convincing model of a heliocentric solar system (a system where the planets orbit the Sun). This replaced the old geocentric model (a system where everything orbited a stationary Earth) which dated back to the ancient Greeks and was the model supported by the Catholic Church's interpretation of Scripture at the time (Copernicus' book was placed on the list of books banned by the Church since it taught "heresy"). Notice that Copernicus' model (at right) shows circular orbits. This was what everyone assumed because circles were "perfect" geometric shapes. The orbits simply had to be circular. Johannes Kepler (1571-1630), a German mathematician and astronomer, born a generation after Copernicus died, was playing around with years of observational data gathered on the orbits of planets gathered by Tycho Brahe (1546-1601) when he discovered that the data fit together a lot better if we assume planetary orbits are not circular, but rather elliptical. From this, Kepler developed his famous three laws of planetary motion showing that planets orbit the Sun in an ellipse with the Sun at one focus of that ellipse. Here's a nice figure illustrating this. I've talked about solstices and equinoxes several times in the blog (use the Search box to find the posts) and they're the positions where the Earth's Northern Hemisphere is tilted toward the Sun (June solstice), the Earth's Southern Hemisphere is tilted towards the Sun (December solstice), or the Earth is tilted neither toward nor away from the Sun (equinoxes). THIS IS THE ONLY REASON WE HAVE SEASONS! When our hemisphere is tilted toward the Sun around June 21, we get more daylight and the Sun is higher in the sky imparting more incoming solar radiation (insolation) and it's summer. 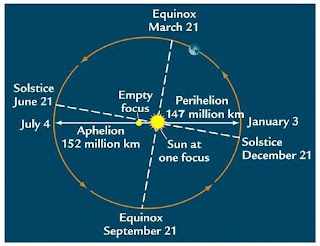 When our hemisphere is tilted away from the Sun around December 21, we get less daylight and the Sun is lower in the sky with lower insolation and it's winter. During the equinoxes around March 21 and September 21, we get about equal-length days and nights and medium amounts of insolation and it's spring or fall. That's also why seasons are reversed south of the equator (as we roast, they're experiencing winter). 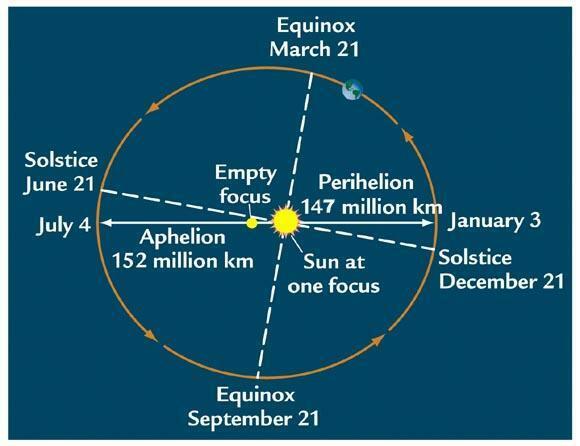 Note in the figure above, however, there are also points labeled perihelion and aphelion. These are the Earth's closest (perihelion) and furthest (aphelion) positions from the Sun in its elliptical orbit. While the diagram says July 4, this year's aphelion was actually at 1500 UTC (11:00 am EDT) on Friday, July 5 (I'm writing this on Monday the 8th). 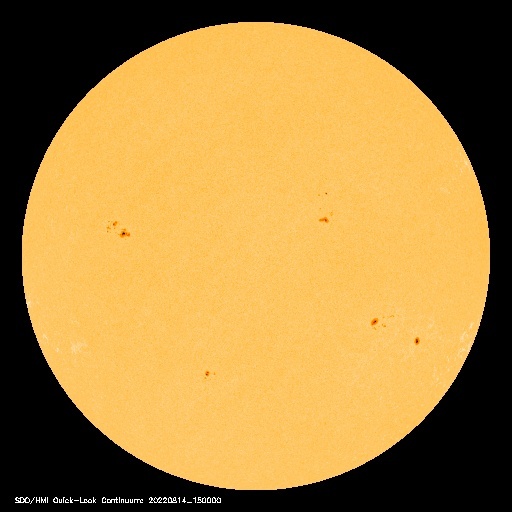 A 3% difference is distance between aphelion and perihelion is not enough to cause noticeable differences in insolation and so plays no role in our seasons. So, even though the summer sun feels like it's close to us as it blazes down on our heads (especially if you go to the desert Southwest where it's well over 100° F), it's actually about as far from us as it gets all year!